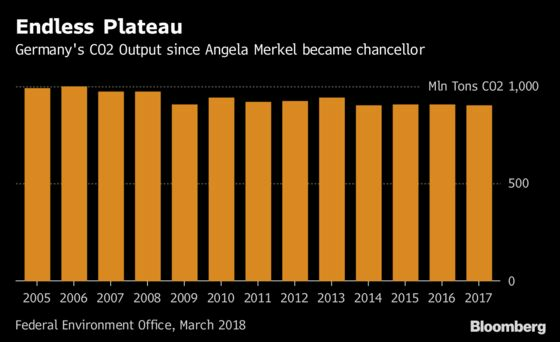 (Bloomberg) -- Chancellor Angela Merkel has assembled top aides to form a “Climate Cabinet” in an 11th-hour move to improve Germany’s climate protection record and avert heavy fines for pollution infringements. Cabinet members including Finance Minister Olaf Scholz, Economy and Energy Minister Peter Altmaier and Environment Minister Svenja Schulze will meet regularly to devise policy to cut carbon emissions in sectors from power generation to agriculture, the government said on Wednesday. While the group’s main job is to map out steps to reduce carbon emissions in their sectors by 2030 in line with Paris Climate Accord pledges, their efforts will come too late to make good on Germany’s current record, Schulze’s ministry said in an email. The federal government is allocating 100 million euros ($114 million) per year in its annual budgets for 2020 to 2022 to pay infringement fines that entail buying pollution permits from Germany’s EU partners. The permits were the world’s best performing major commodity last year, more than tripling in value. They’ve dropped 14 percent this year. The Climate Cabinet must draw up a bill by the end of the year targeting a national reduction of emissions by 55 percent compared with 1990 levels. The fines are linked to an earlier target agreed with the EU seeking a 40 percent cut by next year. Germany will manage a reduction of 32 percent at most, according to Schulze.